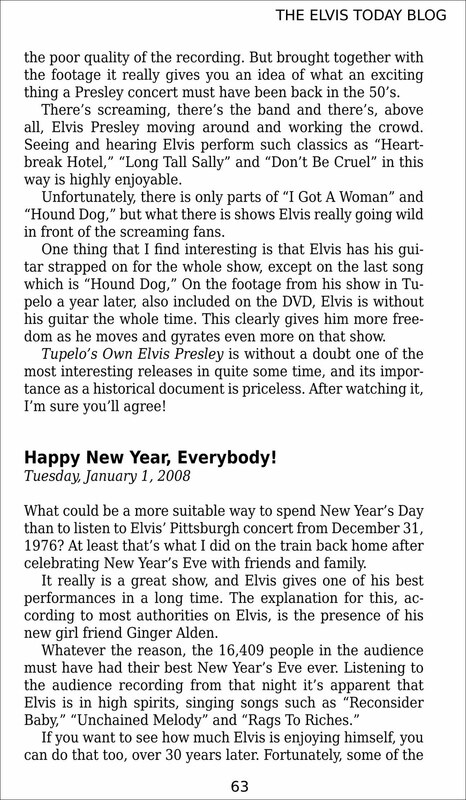 I've spent much of New Year's Day proofreading the manuscript of my book The Elvis Today Blog. As I wrote in August last year, I've decided to collect the 271 posts I've penned from August 16, 2007 to January 8, 2010 in a book. My brother has already done the layout, including the cover, so what's left for me to do is going through the text one more time. It's a time-consuming and monotonous business, but with the help of FTD's New Year's Eve it wasn't too bad, considering. Actually, it has been some time since I've listened to Elvis' Pittsburgh concert from December 31, 1976, and I enjoyed getting reacquainted with it. So much, in fact, that I was going to write a post about it. But that plan was put on the shelf as my proofreading reached the first post from 2008, dealing with – yeah, you guessed it – the Pittsburgh show. So what I decided to do instead, was showing you how that post (or at least the better part of it) will look like in the book. Just click on the thumbnail picture to the right. Originally, it was my intention to have the book ready sometime during the autumn last year. 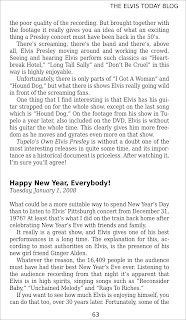 A little delayed, it now looks like it will be possible to order The Elvis Today Blog from Blurb.com later this month. Stay tuned to this blog more more information coming soon. Hi Thomas - as a newer reader and fan of your ELVIS TODAY blog, I am very excited to hear about your upcoming book!! I will definitely be watching for the additional details so that I can order myself a copy when it becomes available! Thank you for TCB'ing for The King! !